Note: these prices do not include shipping and processing to your country. Please inquire. Please inquire for instrument prices and shipping to your country. See below instrument descriptions. 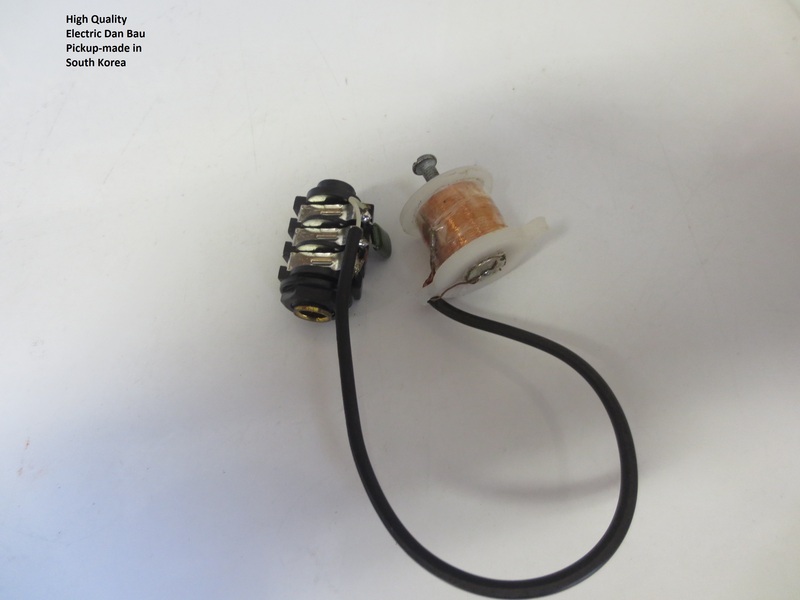 for instrument supplies, instruction manuals, ect. see above. If you are a retail store or interested in ordering any of these instruments or supplies in quantity, we offer wholesale discounts. Please provide details and and tell us what you are interested in, where you are located and in what quantity for a quote. A 2-string with name refers to shape of the sound box. Unlike the Chinese yue'k'i`n, Dan Kim has long, slender fingerboard with unequal frets which allows extreme modulations. 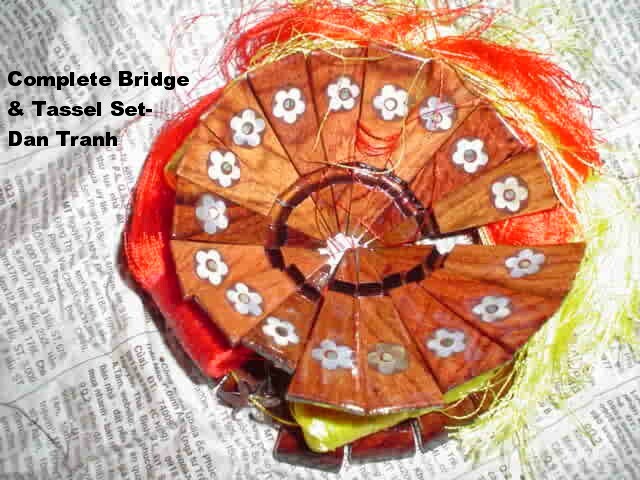 Similar to the Cambodian chapey deng veng. 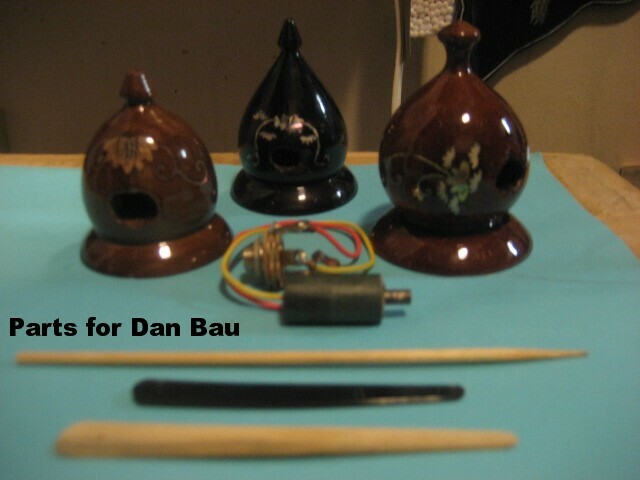 We have both pearl shell inlay decorated and undecorated Dan Bguyets. Inquire for price. Dan Ty Ba is a four-string. It has a pear-shaped body and a neck with a fretted fingerboard that is usually bent just below the tuning pegs. Similar to the Chinese P'i P'�. Size: 37" L X 9-1/2" W. We have both full size and half size Ty Ba's as well as soft or hard shell cases. Inquire for Price. Dan Tam has 3 strings, keyless/fretless fingerboard and ivory capotasto. The neck and cylindrical sound-box are typically decorated/covered with snake skin or alternately turtle skin. Inquire for prices. 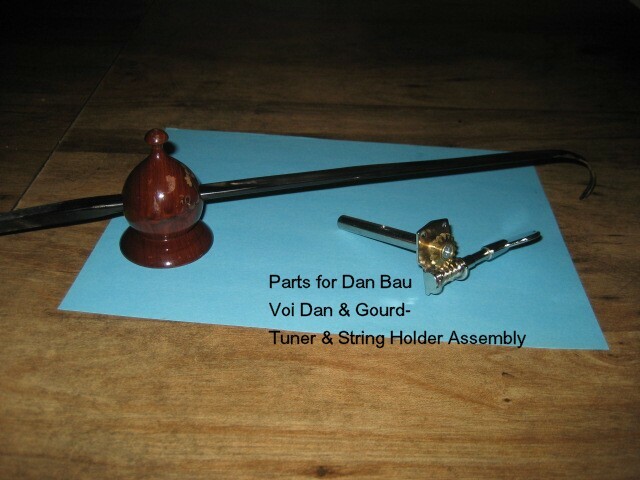 Dan Sen is a 2-string, 14 keys instrument. 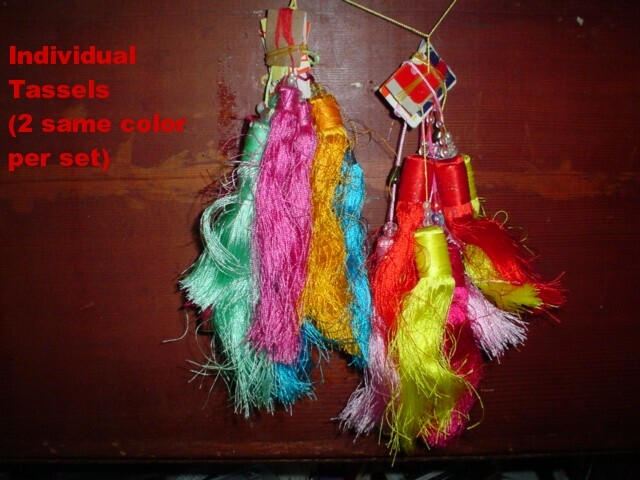 It is only used in the Hat Boi (Traditional Drama) in South Viet Nam. Inquire for price. 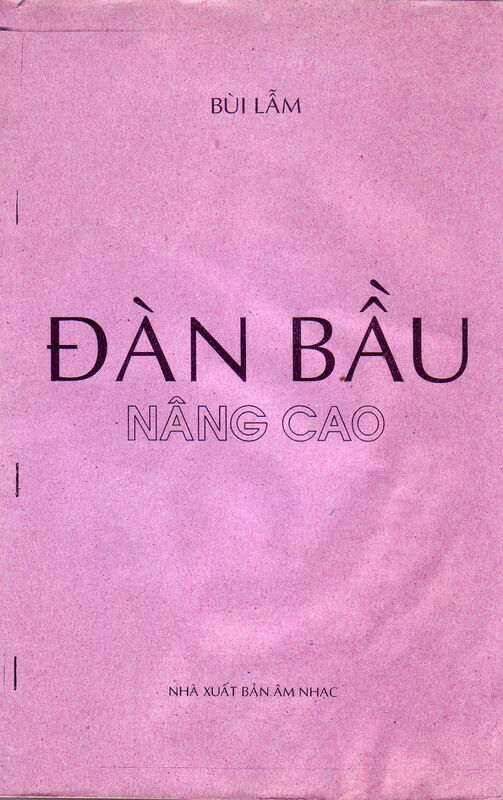 Dan Day is used to accompany the A-Dao (professional singers) in North Viet Nam. Please inquire for price. An acoustical instrument consisting of a sounding box with one string and a movable bridge, used to study musical tones. The instrument's string stretchs over a trapezoidal wood soundboard. The soundboard is made of the hard rind of the bau (type of gourd). Subtle ornamentations, glissandi sounds, and imitation of the human voice could be produced by simultaneously plucking the string and pulling the ancient whammy bar. 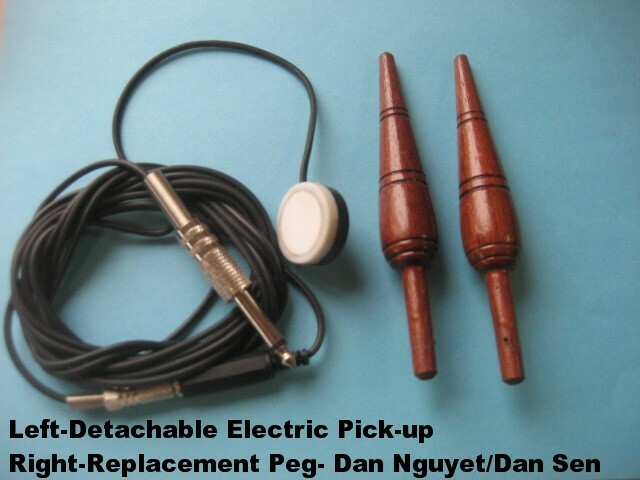 The whammy bar is a flexible bamboo stem which attachs to one end of the soundbox. Some newer models are desgined to fold in half for easy transport. Sound quality is more subtle and quite with the acoustic Dan Bau, while the electric Dan Bau is more robust and fuller sounding. The acoustics of the non electric model depends greatly on the room you are playing in. These are beautiful and very interesting instruments. We offer both pearl shell decorated and undecorated in both fold-up and straight Dan Bau's, as well as soft or hard shell cases for both. 16-21 string zither composes of a flat sound box with strings stretched over it and played horizontally with the fingertips or a plectrum. 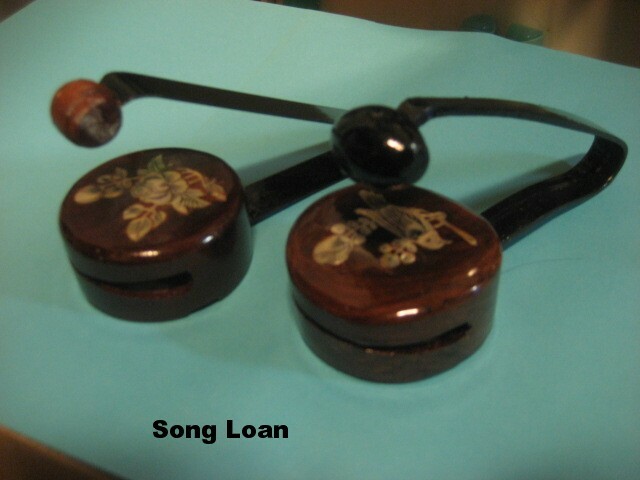 Similar to the Chinese tcheng, strings are supported by movable wooden bridge for tuning. Size: 38" L X 6" W (small end) X 8" W (big end). Instrument Defination: "tranh" : to dispute, to quarrel) According to ancient legends, the Vietnamese zither originality had 32 strings. A zither master taught the art of playing this instrument to his 2 young daughters. One day, these 2 young women argued about who was to play the only musical instrument in their house. The master, very angry, broke the instrument in two and made 2 identical 16 stringed zither to please each of his daughters. This is why the instrument is called tranh, which means "to dispute".This is a high quality-professional instrument, with beautiful pearl shell inlay artwork. The sound board is made of Ngo Dong wood, and the side wood is Cam Lai. These woods are used for the best resonance. 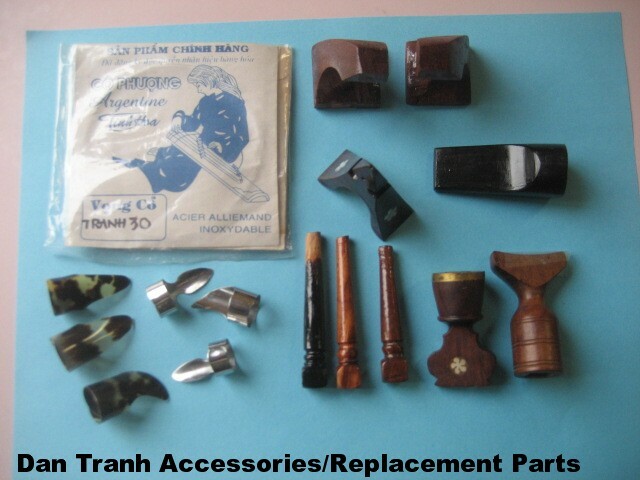 We offer many grades of Dan Tranh in both decorated and undecorated styles, as well as hard shell or soft case. Note: We have shipped many Dan Tranh's all over the world and found that the soft-well padded carry case, (well packed) offers the best shock protection for shipping. Please inquire for prices, styles and additional photos not shown on this website.